After a sleek, stylish, powerful computer? You're in luck, because Apple's got lots of them – from the lightweight Apple MacBook to the power juggernaut that is the Mac Pro. If you're wondering which of these models is the right one for you, you've come to the right place. Here we'll explain everything you need to know about all the Macs that Apple currently sells direct on its website: specs, price, features and more. By the time we've finished you should be able to make a much more informed choice about which one you should get. The all-in-one iMac looks fantastic, has plenty of power for all but the most demanding users, and won't clutter up your desk – perhaps the only negative you could level against it is that it's not particularly portable (though in theory you could lug it between home and the office). Like a lot of Apple's hardware, it's also due an update. 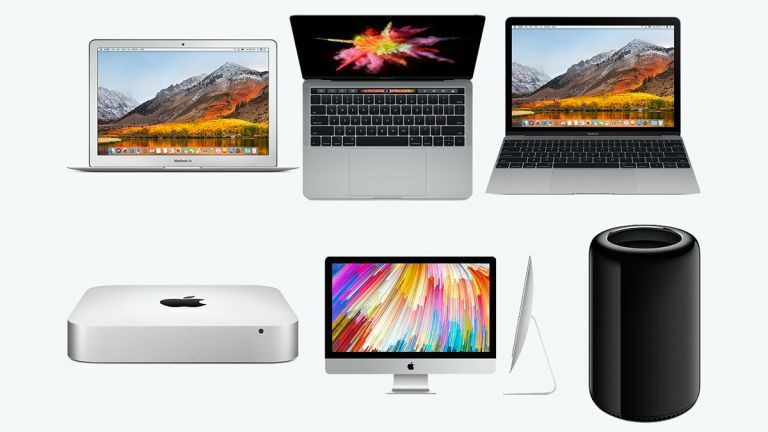 The current configurations on offer on the Apple website let you choose between a 21.5-inch 1,920 x 1,080 pixel resolution display, a 21.5-inch 4,096 x 2,304 resolution display, and a 27-inch 5,120 x 2,880 pixel resolution display. You can go from 8GB all the way up to 64GB of RAM, while the storage options range from 256GB to 2TB. AMD Radeon discrete graphics are available too, should you need them, and the processor options go from dual-core Intel i5 chipsets to quad-core Intel i7 chipsets. With all those options, the prices vary hugely, and that's another point in the iMac's favour: you can configure it to be as affordable or as powerful as you need. It's the best Apple desktop for the majority of users. Despite its faults, including a rather pointless Touch Bar (optional on the 13-inch model), a limited number of ports, and a keyboard that's reportedly more fragile than the designs that came before it, the MacBook Pro remains a fine laptop. Like the iMac Pro, it's expensive, but you get a lot for your money. You also get a lot of configuration options. A screen measuring 13.3 inches with a 2,560 x 1,600 pixel resolution, or 15.4 inches with a 2,880 x 1,800 pixel resolution; dual-core or quad-core i5 or i7 processors from Intel with a variety of clock speeds; and between 8-16GB of RAM and 128GB-2TB of storage. The 15.4-inch models come with discrete AMD Radeon graphics too. It's the most power and performance you can get in an Apple laptop, and the recent redesign means you're getting a modern, elegant-looking machine as well. A Mac we'd definitely recommend, if you've got the cash. If you can't afford the super-powerful, super-expensive MacBook Pros, or you just want something that's a little more lightweight, check out the latest MacBook – it's very sleek and portable, and will last you a long time between charges. The specs are a step down from the more powerful MacBooks though. Dual-core Intel m3 or i5 processors, 8-16GB of RAM, and 256-512GB of storage. The 12-inch display runs at a resolution of 2,304 x 1,440 pixels. These aren't computers that you can do a lot of demanding work on, but they'll handle most tasks well enough. Every laptop is a balance between portability and power, and the MacBook sways towards the former – and of course you can save some money as a result. It also comes in four attractive colours: rose gold, space grey, gold and silver. The flagship all-in-one iMac Pro is the computer Apple has most recently refreshed, and while it's going to be way too powerful and too expensive for ordinary users, its performance levels and sheer beauty can't be denied. If money is no object, in other words, this is the Mac to get – you can get it with a Xeon processor that goes all the way up to 18 cores if you want. That's paired with a maximum of 128GB of RAM, up to 4TB of storage, and Radeon Pro Vega graphics. This is going to take everything that you can throw at it and then some. And what about that 5K screen? With 5,120 x 2,880 pixels, stretched across 27 inches of display, it's simply stunning. To top it all off, everything is wrapped in a sleek, all-in-one unit that will look great on any desk. We saw a refresh of the MacBook Air last year, but it was only a processor speed tweak, with no changes to the display, design or other internal components. That makes it one of the Apple computers showing its age the most – rumours of its imminent demise continue to float around – but it remains on sale as Apple's cheapest MacBook. The most up-to-date spec gives you a 13.3‑inch, 1,440 x 900 pixel resolution display, from 128GB to 512GB of storage, and 8GB of RAM. Everything is powered by a dual-core Intel i5 or i7 processor and integrated Intel graphics, all of which means you won't get top-level performance from a MacBook Air – but again, it's the cheapest laptop Apple currently sells. That makes it appealing to those who want to use macOS on the go on a budget, and the battery life of 12 hours or thereabouts adds to the appeal of the MacBook Air as well. The model might be clinging on in Apple's line-up, but it still has its advantages. Obviously we're not putting the Mac Pro lower down in this list because of its performance – which is off the charts – but because it's outrageously expensive, not all that well designed, and a bit of an oddity. Apparently it's about to be replaced too. If you want the most power a Mac can give you today, and you're prepared to pay for it, then don't let us stop you. The Mac Pro boasts up to an 8-core Intel Xeon processor, up to 64GB of RAM, up to 1TB of storage, and graphics choices that top out at dual AMD FirePro D700 GPUs, with 6GB of RAM of their own... each. Those are some eye-watering specs, and make the Mac Pro an appealing option for serious creatives (you can connect up to six displays, if you want). As for that circular design, some people love it, but we're not so sure – it sounds like the Mac Pro's successor will have a different look (and might be easier to upgrade too). Only worth considering for the wealthiest and most demanding users. How about a refresh, Apple? The Mac Mini still clings to life, though it hasn't been updated since 2014 – and that's the main reason it's the bottom of our list, because we otherwise love the idea of a dinky little Mac computer that you can move around and plug into any display you like. Take a look at the specs though and you'll see this is ageing hardware: dual-core Intel i5 or i7 processors (though these are the 2014 models, not the newer ones), 500GB-1TB of storage, 4-8GB of RAM, and integrated Intel graphics. The fact that you can still get a Mac Mini without an SSD drive tells you how much it's showing its age. The Mac Mini can still do a job for you today and is a decent buy if you already have a monitor, keyboard and mouse somewhere (or want an alternative to the Apple TV). Do bear in mind though that a much-needed refresh is apparently on the way.